For the cathedral in the Faroe Islands, see Magnus Cathedral. St Magnus Cathedral, Kirkwall dominates the skyline of Kirkwall, the main town of Orkney, a group of islands off the north coast of mainland Scotland. It is the most northerly cathedral in Britain, a fine example of Romanesque architecture built for the bishops of Orkney when the islands were ruled by the Norse Earls of Orkney. It is owned not by the church, but by the burgh of Kirkwall as a result of an act of King James III of Scotland following Orkney's annexation by the Scottish Crown in 1468. It has its own dungeon. Construction began in 1137, and it was added to over the next 300 years. The first bishop was William the Old, and the diocese was under the authority of the Archbishop of Nidaros in Norway. It was for Bishop William that the nearby Bishop's Palace was built. Before the Reformation, the cathedral was presided over by the Bishop of Orkney, whose seat was in Kirkwall. Today, it is a parish church of the Presbyterian Church of Scotland, and therefore technically no longer a cathedral. The Orkneyinga Saga tells how bloodthirsty intrigue and saintly piety led to the cathedral's foundation. Other accounts tell a similar, though slightly less saintly, tale. St Magnus had a reputation for piety and gentleness. On a raid led by the King of Norway on Anglesey, Wales, Magnus refused to fight and stayed on board singing psalms. King Eystein II of Norway granted him a share of the earldom of Orkney held by his cousin Håkon, and they ruled amicably as joint Earls of Orkney from 1105 to 1114. Their followers fell out, and the two sides met at a thing (assembly) on Orkney Mainland, ready to do battle. Peace was negotiated and the Earls arranged to meet each other on the small island of Egilsay, each bringing only two ships. Magnus arrived on 16 April 1116 (or 1117) with his two ships, but then Håkon treacherously turned up with eight ships. Magnus was captured and offered to go into exile or prison, but an assembly of chieftains insisted that one earl must die. Håkon's standard bearer refused to execute Magnus, and an angry Håkon made his cook Lifolf kill Magnus by striking him on the head with an axe. Magnus was buried in the Christchurch at Birsay. The rocky area around his grave miraculously became a green field, and there were numerous reports of miraculous happenings and healings. William the Old, Bishop of Orkney, warned that it was "heresy to go about with such tales", then was struck blind in his Birsay cathedral and subsequently had his sight restored after praying at the grave of Magnus, not long after visiting Norway (and perhaps meeting Earl Rögnvald Kolsson). Gunhild, sister of Magnus, had married Kol, and the king of Norway granted their son Rögnvald Kolsson the right to his uncle's earldom in 1129. Earl Rögnvald eventually took a fleet to Orkney, but the islanders resisted and Earl Paul who had succeeded Håkon would not give up control without a fight. Then, Earl Rögnvald Kolsson was advised by his father Kol to promise the islanders to "build a stone minster at Kirkwall more magnificent than any in Orkney, that you'll have [it] dedicated to your uncle the holy Earl Magnus and provide it with all the funds it will need to flourish. In addition, his holy relics and the episcopal seat must be moved there [from Birsay]". Meanwhile, Rögnvald secretly had Paul kidnapped and shipped away, later to be murdered in Caithness. Rögnvald duly became Earl of Orkney. Work on the cathedral began in 1137, under the direction of Kol. When funds ran short, Kol advised Rögnvald to restore odal rights for cash payment. In 1158, while work was still under way, Rögnvald was killed by a Scottish chieftain. His bones were brought to the Cathedral and he was canonised in 1192, though the records of his sainthood are missing. Rögnvald's bones were found and re-interred during work on the building in the 19th century. The Romanesque cathedral begun in 1137 has fine examples of Norman architecture, attributed to English masons who may have worked on Durham Cathedral. The masonry uses red sandstone quarried near Kirkwall and yellow sandstone from the island of Eday, often in alternating courses or in a chequerboard pattern to give a polychrome effect. As completed during the 12th century, the original cathedral had three aisled bays to the chancel with the bay at the east end shorter, and apsed in a similar way to the original apse at Durham, a transept with single east chapel, and eight bays to the nave as at Durham and Dunfermline Abbey. When the cathedral was ready for consecration the relics of St Magnus were enshrined in it. In 1917, a hidden cavity in a column was found, containing a box with bones including a skull showing a wound consistent with a blow from an axe. The original cathedral comprises the choir of today's church. In the late 12th and early 13th century, the building was extended to the east with vaulting throughout, and, in the late 14th century, the present lower front was joined to the rest of the building. These later elements introduced the Gothic style with pointed arches. In 1468, when Orkney was annexed for Scotland by King James III, St Magnus Cathedral came under the control of the Archbishop of St Andrews; the Bishops of Aberdeen and Orkney were subsequently of Scots rather than Scandinavian origin. Most notable amongst them was Bishop Robert Reid, who presided at St Magnus from 1541 to 1558. The Protestant Reformation in 1560 had a less dramatic effect on St Magnus Cathedral than in some other parts of Scotland, but the church had a narrow escape in 1614. Government forces suppressing the rebellion of Robert, the son of Patrick Stewart, 2nd Earl of Orkney, had besieged and destroyed Kirkwall Castle and intended to destroy St. Magnus Cathedral after rebels had hidden inside. The bishop James Law intervened to prevent them from carrying out this plan. Major work was undertaken on the cathedral in 1908 by the architect George Mackie Watson: this included replacing the dumpy slated pyramid atop the tower with a taller spire clothed in copper sheeting. As a result, today's cathedral looks much more as it did until its original spire was struck by lightning in the late 17th century. Restoration and renovation work on the building continues, with increased urgency since it was discovered in the 1970s that the west end of the cathedral was in danger of collapsing away from the remainder of the structure. Other work has progressed further, and to celebrate its 850th anniversary in 1987 Queen Elizabeth II unveiled a magnificent new west window. St. Magnus is the only wholly mediaeval Scottish cathedral, and one of the best-preserved buildings of the era in Britain. St Magnus Cathedral is a tourist destination. The age of much of its structure means it has smaller windows than those found in more modern churches. The tall narrow nave gives the illusion of much greater size than is actually the case. The cathedral contains memorials to prominent Orcadians including explorers William Balfour Baikie and Dr John Rae, writers Eric Linklater, George Mackay Brown and Edwin Muir, artist Stanley Cursiter and psychiatrist Sir Thomas Clouston. At the same time as the original cathedral was being constructed, the Bishop's Palace was built nearby for William the Old, with a large rectangular hall above vaulted store rooms. King Haakon IV of Norway, overwintering after his defeat at the Battle of Largs, died here in December 1263, marking the end of Norse rule over the Outer Hebrides. The King was buried in St Magnus Cathedral until the weather was good enough to return his remains to Bergen. The palace fell into ruins, then after 1540 was restored by Bishop Robert Reid who added a round tower, the "Moosie Toor". He presided at St Magnus from 1541 to 1558 and, incidentally, also founded the University of Edinburgh. The ruins of the Bishop's Palace are open to the public (see Historic Scotland). Opposite the Bishop's Palace, the ruins of the Earl's Palace give a reminder of the cruel reign of the Stewart Earls of Orkney during the late 16th and early 17th centuries; they too are open to the public. In 1671, when the tower of the church was struck by lightning and burned, the bells fell into the church. It is said that townspeople hurried soft material into the church to catch the bells, should they fall, but despite their efforts, the largest bell did suffer a rift. Therefore, in July 1682, the church authorities contracted with Alexander Geddes, merchant in Kirkwall, to deliver the bell to Amsterdam, where it was recast by Claudius Fremy. On arrival in Amsterdam, the bell was weighed and was found to be 1,500 pounds (680 kg). It lost 65 pounds (29 kg) in casting, but 193 pounds (88 kg) pounds of "new metal" was added, resulting in a finished weight of 1,528 pounds (693 kg). The new tongue in the bell weighed 46 pounds (21 kg). Geddes returned the bell to Kirkwall on 23 August of the same year. The original turret clock was built in 1761 by an Aberdeen clockmaker named Hugh Gordon. The organ was installed in 1925 and built by Henry Willis. It has been maintained by the same firm ever since. A specification of the organ can be found on the National Pipe Organ Register. 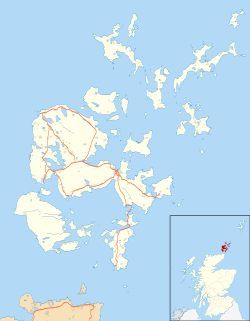 ^ Waugh (2003) states that Kirkwall is recorded in the Orkneyinga Saga as Kirkjuvágr meaning "church voe" or "inlet of the sea with a church situated at its inner end". ^ Waugh, Doreen J. "Orkney Place-names" in Omand (2003) p. 118. ^ "Centenary of St Magnus bones discovery". The Orcadian. Retrieved 31 March 2019. ^ Goold, David. "Dictionary of Scottish Architects - DSA Architect Biography Report (February 13, 2017, 7:52 pm)". ^ Ellacombe, Henry Thomas (1875). The Church Bells of Somerset: To Which Is Added an Olla Podrida of Bell Matters of General Interest. books.google.com. Exeter: William Pollard. Retrieved 21 June 2014. ^ "St. Magnus Cathedral, Kirkwall, Orkney Islands". Resources for Learning in Scotland. Retrieved 21 June 2014. ^ Hossack, B. H. (1900). Kirkwall in the Orkneys. Kirkwall: William Peace & Son. p. 32. ^ "NPOR N18236". National Pipe Organ Register. British Institute of Organ Studies. Retrieved 22 August 2017. Wikimedia Commons has media related to St Magnus Cathedral, Kirkwall. This page was last edited on 31 March 2019, at 11:22 (UTC).